During my recent trip to Ladakh, I made this star trail of the beautiful and ancient, Namgyal Tsemo Gompa in Leh. In this blog post, I would not only be covering the story behind the image but also, the techniques which went into producing this final image. So that you too can shoot star trail. I will be breaking down the image into various parts, including the story behind the image and the technical aspects that went into producing this image. Let’s start with the story behind the image. 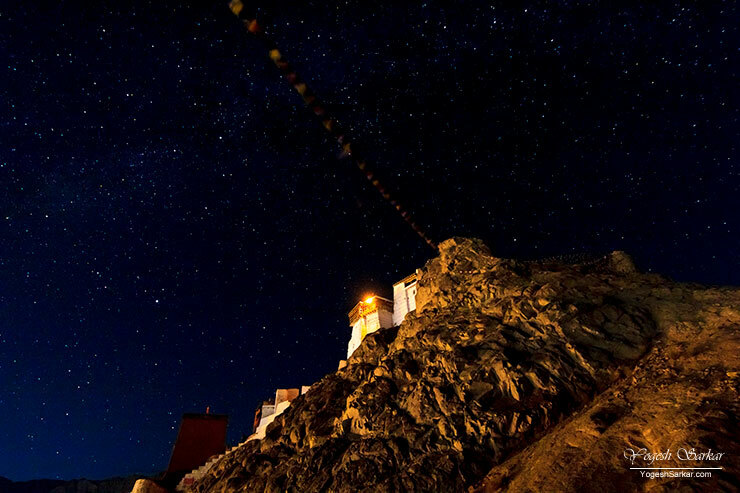 I was walking back from KC Garden Café in Leh around 11:45pm with friends, when Mini, Rahul, Prashant, and I decided to head to Shanti Stupa for night photography. So we got inside Rahul’s Safari and drove to Shanti Stupa. However, Shanti Stupa is open till 9pm, and while we could have walked in since the gate was open, we decided against doing that. And instead headed for Namgyal Tsemo Gompa. 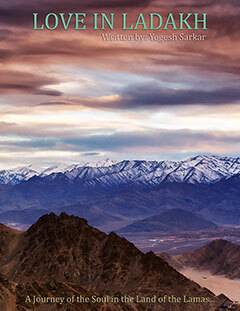 A place I love for its beautiful and panoramic view of Leh City. 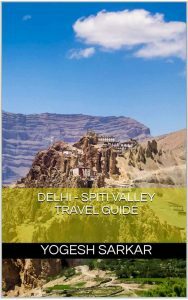 Once we reached Namgyal Tsemo Gompa, I took out my mobile phone to track where the North Star was, and as I had hoped and suspected, it was right behind the Tsemo Monastery. Better still, I got a great angle, right from the parking lot. So I set up my tripod, camera, and timer and took an image at f5, 20sec, and ISO800. The image came out darker than I wanted, also the composition was a little off. Since I did not wish to shoot slower than 20sec, as I was also planning to make a time-lapse from the image sequence I was shooting. I opened the aperture by one-third of a stop, and at f4, and I got the image I wanted. I then setup my camera to shoot a sequence of 118 images, which ultimately made the star trail image posted above and also this time-lapse. Now let’s get down to the technical aspects. While shooting a star trail, the first thing you need to determine is the position of North Star, if you want a spiral trail. This is due to the fact that when the earth rotates during the duration of time you’re shooting photographs, others stars will seem to shift their position in the sky, while North Star appears to remain stationary (in the final processed image). Shooting a single long exposure to get star trail directly out of the camera is the easiest way to go, however, it causes the camera sensor to heat up and produce a lot of hot pixels and noise. Also in case the camera battery runs out during the course of exposure, or someone moves in front of the camera, your entire effort will get wasted. Shooting multiple images allows the camera to run somewhat colder, leads to less noise and you can use the sequence of images to produce time-lapse as well. A star trail image with nothing in the foreground isn’t all that impressive. To make your image stand out from the rest, make sure your composition includes something of interest in the foreground. 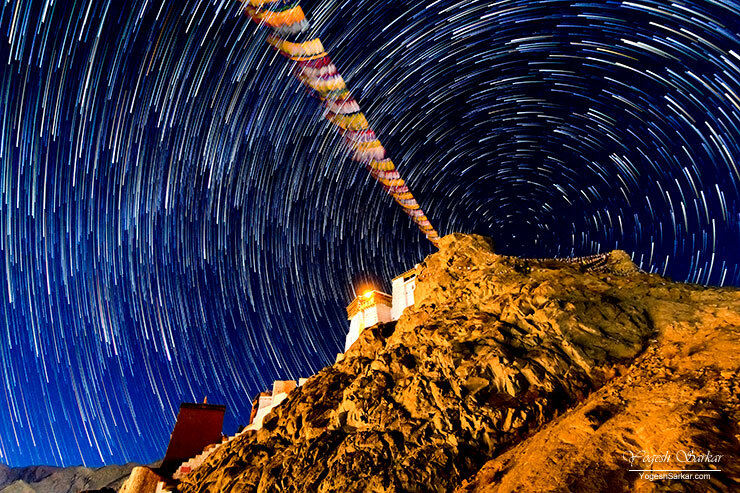 In this case, Namgyal Tsemo Gompa made the image beautiful and interesting. Ultra Wide Angle lenses are best for star trails, as they help you showcase the wide expanse of the night sky. However a lot depends on your composition and plan for the image, so although it is best to go as wide as possible, focus on a strong composition to determine the focal length for the image. If you’re shooting a single exposure, then you need to put the camera in bulb mode and shoot at least 30-minute long exposure, in order to get the decent spiral effect. The longer the duration, the better would be the result, however, noise too will increase. In case, like me, you’re opting to shoot multiple images to produce the star trail. Then you need to keep the shutter speed between 20 to 25 seconds. Any longer and the stars will lose their round appearance, making images unsuitable for time-lapse. Shooting with a wide open aperture on a fast lens ensures you can get cleaner images. However no lens is sharp wide open, stopping down a little, will help you get sharper images. Given a choice, though, open the aperture first, before increasing the ISO. F4 got me the result I needed at ISO800 with a shutter speed of 20seconds since the sky was relatively clear and stars brightly visible. Unless you have extremely limited space on your memory card, always shoot in RAW. It will help you get better results during post-processing, especially when it comes to white balance. Make sure long exposure noise reduction is off, otherwise, it will not only double the duration of time you will need to shoot the sequence of images, it will also lead to breaks in the star trail, leading to dotted lines, instead of the smooth spiral. Make sure your tripod is locked properly and will not cause any movements. Once you’re satisfied with the test images. Put the camera on burst mode, and switch off the LCD screen to conserve battery. With camera in manual mode with all the required settings, lock the remote shutter release switch in place. Sit back and let the camera do its work. I shot 118 images in this sequence, which took over 40mins to shoot. Overall, I spent around an hour photographing this star trail, so make sure to have plenty of patience. With the images photographed, it is time to process them. 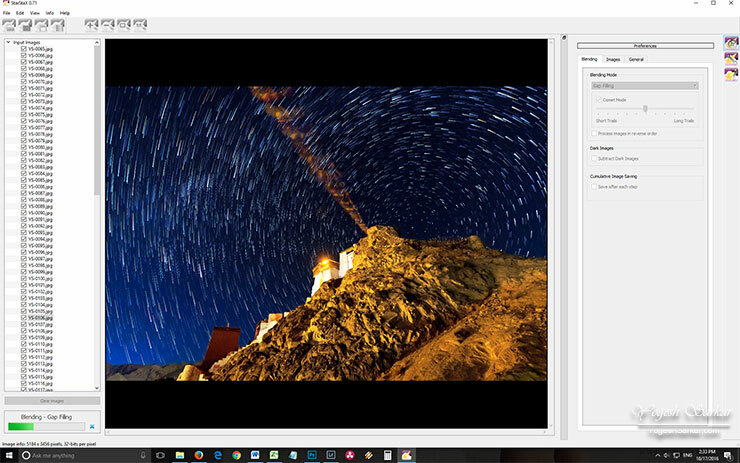 Treat the star trail images as any other images, and process them to your taste in your favorite RAW editor, in my case, it is Lightroom CC. In lightroom, I work on one image to get the right look and then sync the settings to rest of the images (batch process). This means I do not have to process multiple images. I then export all the images out in JPEG format. I use a free software, StarStaX to stack my star trail images. In the case of this image, I used the blending mode, Gap Filling along with Comet mode to get the look I wanted for my star trail image. For the final touch, I used Photoshop CC, and it essentially consisted of increasing the contrast and somewhat decreasing the saturation of the hill on which Tsemo Gompa is situated. Final words: At the end of the day, 2 most essential needed to produce beautiful images are patience and vision. Without these, your efforts will lead nowhere. So concentrate on developing your own style of photography, and have a vision of the final result in mind, while you’re out there, taking photographs in the field. Nicely explained Yogesh, thanks ! Great picture as always.. Nice step by step writeup, so easy to understand. Thanks for the effort.